Lava highway in Kanaga Island (Western Aleutians, Alaska). Credit: Mattia Pistone (distributed via imaggeo.egu.eu). On a rare sunny day, Mattia Pistone (a researcher at the Smithsonian Institution in Washington DC) was able to capture this spectacular shot of Kanaga, a stratovolcano in the remote Western Aleutians, which is usually veiled by thick cloud. The Western Aleutians form a chain of 14 large and 55 small volcanic islands, belonging to one of the most extended volcanic archipelagos on Earth (1900 km), stretching from Alaska across the northern Pacific towards the shores of Russia. As part of a team of researchers, Mattia spent three grueling weeks in the isolated region. Being one of the most extended volcanic arc systems on Earth, the Aleutians can shed light on one of the most fundamental questions in the Earth sciences: how do continents form? The Earth’s landmasses are made of continental crust, which is thought to be largely andesitic in composition. That could mean it is dominated by a silicon-rich rock, of magmatic origin, which is fine grained and usually light to dark grey in colour. However, basaltic magmas derived from the Earth’s upper mantle and erupted at active volcanoes contribute to chemistry of the continental crust. The fact that continental crust bears the chemical hallmarks of both suggests that the formation of new continents must somehow be linked to motion of magma and its chemistry. Establishing the link between magma generation, transport, emplacement, and eruption can therefore significantly improve our understanding of crust-forming processes associated with plate tectonics, and, particularly, help determining the architecture and composition of the continental crust. The Alaska-Aleutian archipelago is a natural laboratory which offers a variable range of volcanic rocks. The islands present a perfect opportunity for scientists to try and understand the origin of continents. 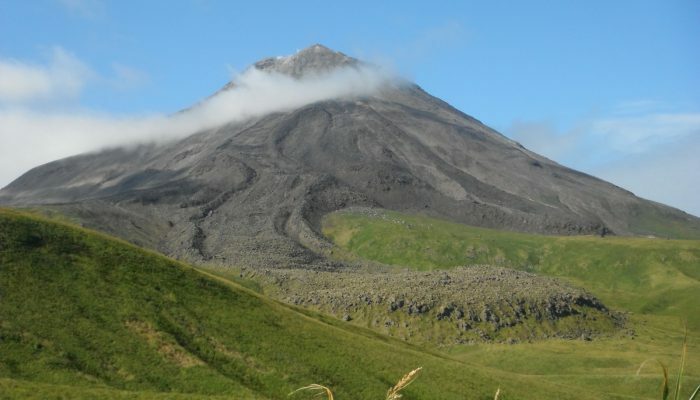 By collecting samples of volcanic ash erupted at Kanaga and other volcanoes of the Aleutian arc, Mattia and his colleagues are currently investigating the origin of this volcanic ash. Understanding its chemistry allow the team to get a clearer idea of the conditions that were present while the magma was forming and ascending, for example, how much water and iron were present. The team were based on the Maritime Maid research vessel, and hoped from island to island collecting samples and taking measurements of volcanic activity as part of a large research consortium called GeoPRISMS, funded by the National Science Foundation. The field work was supported by a Bell 407 helicopter and its crew. Today’s featured image shows an andesitic lava flow erupted in 1906. The volcanic deposits were explored during the field geological mission by Mattia and the team. Kanaga last erupted in 1994. Ash from that eruption was found in the nearby island of Adak. Even at present, there is a highly active system of fumaroles at the summit of the volcano. If you pre-register for the 2017 General Assembly (Vienna, 22 – 28 April), you can take part in our annual photo competition! From 1 February up until 1 March, every participant pre-registered for the General Assembly can submit up three original photos and one moving image related to the Earth, planetary, and space sciences in competition for free registration to next year’s General Assembly! These can include fantastic field photos, a stunning shot of your favourite thin section, what you’ve captured out on holiday or under the electron microscope – if it’s geoscientific, it fits the bill. Find out more about how to take part at http://imaggeo.egu.eu/photo-contest/information/.